The road to baseball Upper State championships will run through Spartanburg County. County teams placed at least one team in the Upper State bracket in every classification the county is represented in on Tuesday night, as four teams brought home District titles. Boiling Springs defeated T.L. Hanna 6-1 in the 5A District III championship. 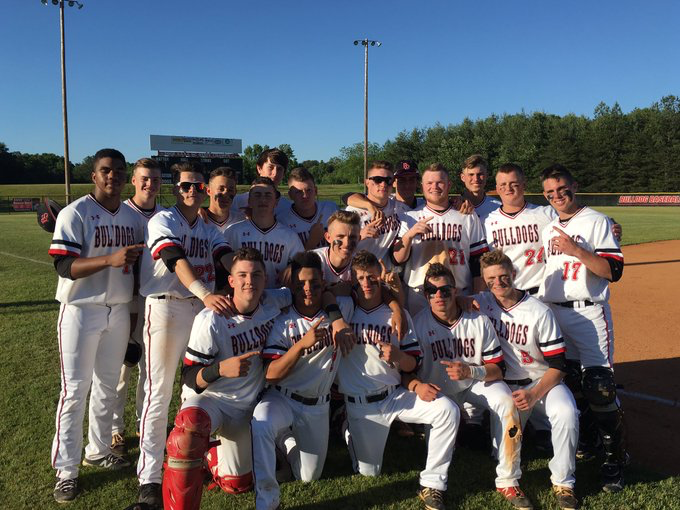 The Bulldogs built a 2-0 lead through four innings , tacked on four in the fifth and cruised to the title over the Yellow Jackets. Woodruff took a quick 1-0 victory over Palmetto for the 3A District II title. Nick Smith powered the Wolverines, tossing a complete game two-hitter and striking out 10. Smith also drove in the game’s only run at the plate. Chesnee took care of things the hard way, dropping a wild 11-9 first game against Ninety-Six before regrouping and blowing the Wildcats out 10-0 in six innings in the deciding contest. Nate Lamb was phenomenal in the nightcap, The College of Charleston commit tossed a shutout with 11 strikeouts and drove in a pair of runs at the plate. Forced to handle things the hard way, Landrum did just that, going on the road to down Abbeville 9-7 and 5-4 to win the 2A District II title. Landrum was down 7-0 after just two innings, but ripped off 9 unanswered runs to take the game one victory. In the deciding game, Landrum led 1-0 before falling behind 3-1 after four innings. The Cardinals took a 4-3 lead in the top of the fifth, saw Abbeville tie it up in the sixth and scored the winning run in the top of the ninth. The Cardinals and Eagles will renew their region rivalry on Thursday night as the 2A Upper State bracket begins. On the other side of the bracket, St. Joseph’s and Fox Creek will square off. Woodruff’s 3A Upper State bracket will begin against Seneca, which defeated Chapman 7-3 for the 3A District I title. The other side of the 3A bracket will feature Mid-Carolina and Powdersville. Boiling Springs will visit Northwestern in one half of the 5A Upper State bracket. Fort Mill will visit Westside to round out the bracket.